There is a neat little community in Northeast Tallahassee, tucked away behind the Village Commons Shopping Center and it is called the Villages at Maclay. This 250 home community offers both townhomes and single family detached homes, so there is something for everybody in the current price range from the mid $100Ks to the mid $200Ks. Relatively speaking, the homes are new(ish), with construction only going back to 1997. Due to its smaller number of homes and varying types, the graphs we produce for our report have a little more "noise" than you see from our larger neighborhoods, but this community continues to sell enough homes to find itself on our top 30 list so we keep reporting :). In this report, we will look at long term average home price trends, value trends, and size trends of homes sold in the Villages At Maclay, as well as all current listings in the Tallahassee MLS and all closed home sales going back to 1997. It is important to note that the narrative contained below is for sales through December for all previous years, but through the first week of November in 2015. The graphs and the closed sales table will be continuously updated into the future (meaning bookmark this page if you always want to know the current status of homes in the Villages At Maclay). Average home prices fell slightly in 2014, and remain fairly flat since starting this plateau in 2012. The average home price in the Villages At Maclay have been very stable for the past four years, ranging between $181K and $185K, and currently is at $182,000. Home sales activity remains lower than the levels recorded prior to the housing market expansion and subsequent collapse, so look for pent-up supply to be a factor when homeowners need to move. Thus far in 2015, there have been 11 closed home sales in the Villages At Maclay. Average home values in the Villages At Maclay have declined almost 2% in 2015, though they truly have not moved much going all the way back to 2009. Through the second week of November, the average value of a home sold in the Villages At Maclay has been $123 per square foot. The average home size sold in the Villages At Maclay typically falls in a range of 1,400 to 1,550 square feet, and this year home size averages are no different. The 11 sales thus far in 2015 have averaged 1,464 square feet. 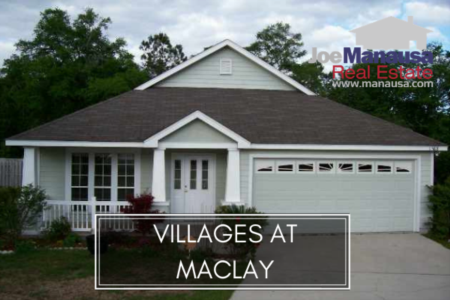 The following map and list of homes are the most recent listings in Villages At Maclay. If no homes are shown, that means that none are currently listed for sale in the Tallahassee MLS (or the ones that are have contracts on the them already). 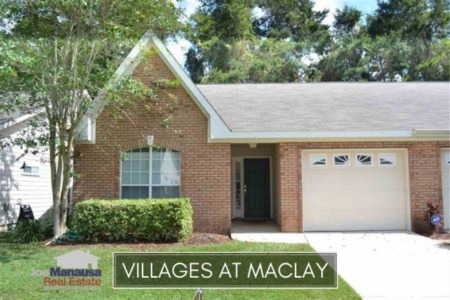 This list is updated every 15 minutes, so you can be assured that this page will always bring you the most up-to-date listings and sales that can be found for Villages At Maclay (bookmark this page if this is an area that you want to track). The following list shows nearly 500 home sales in the Villages At Maclay going back to 1997, the year the first home sales were recorded. I hope you enjoyed our November 2015 update on home sales in the Villages At Maclay, please feel free to drop me a note if you have questions not covered in this report.